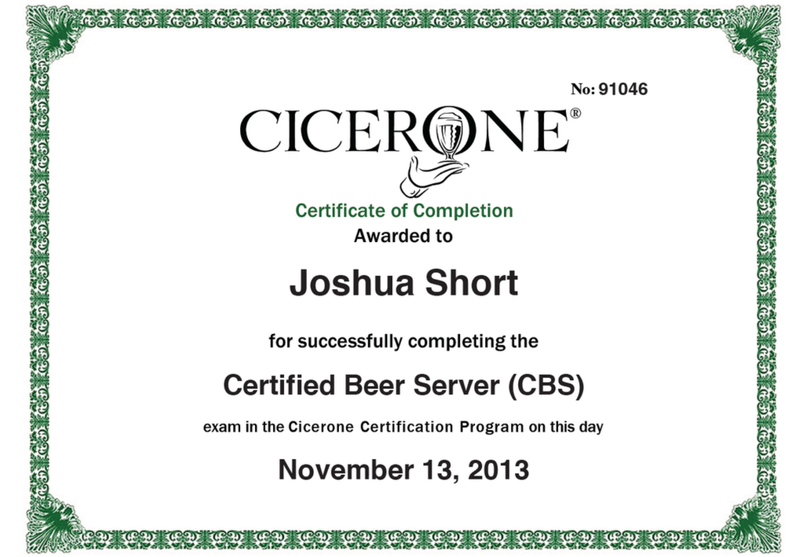 Officially a Cicerone Certified Beer Server! Hey everyone — I have exciting news! I’m officially a Cicerone Certified Beer Server! I have lots to say about the exam which I’ll package up in another more extensive post. But for now I’m going to relish in this accomplishment and cross off another item on My Impossible List. Cheers! This entry was posted in Cheers, Cicerone CBS Exam, Education, Journey and tagged accomplishment, Beer Server Exam, Certified Beer Server, Cicerone Certified Beer Server, Cicerone Certified Beer Server Exam, Josh Short Certified Beer Server, Josh Short Cicerone, My Impossible List, Short On Beer by Josh Short. Bookmark the permalink. Thanks! Have you gone after BJCP yet? No way! I think I’ll be content if I can just get a few more posts up about it! Well done! What do you think of the test, now that you’ve taken it and passed? I’ll have a full recap next week but overall it was a good test of knowledge. I couldn’t have passed without studying but probably could have studied less. There’s no way I would have passed it, or even attempted it, a year ago before starting this blog and meeting all my new beer friends. Really glad I had the social accountability to do it and I finally said screw it and just took the exam. Yeah. That’s very similar to how I started my blog in preparation for the Certified Cicerone® test. Blog as study tool! Were there any questions on the draft system or alcohol affects/serving law? Yes. If I remember correctly everything about draft systems was covered in the syllabus (link below). Intoxication levels was pretty big too. However the vast majority was common sense. Just do a little reading up on determining BAC.